Stay connected, just Bopup me! We get a lot of requests and inquiries from our customers and clients that ask us regarding our software and its functions. Sometimes the customer explains his situation which he want to get resolved or avoided with Bopup instant messaging products. Since the products have rich functionality and options so it is possible to set up and tune the software in most cases. You can find some answered and solved requests here, in our blog, under the "Tips & Tricks" label. Sometimes users on the network enter to Windows under the same logon ID, for example "Administrator" account name. If you install and use the communications server you need to separate that users and give them different and unique names in order to contact them personally and to allow the users to communicate with others. It is possible to do that. You should create new users on the communication server with different logon (account) names and set a personal authentication method for each user. In addition to the global Authentication Mode that you can find in the Options window of the Management Console you can set up an authentication method for each account personally. Get the properties of the user account on the server and go to the Authentication tab. Then enable the “Use personal authentication method” check box and choose an appropriate mode to authorize the user. Now let's return to our question and our situation. In order to accept connections from the same Windows logon ID, let's call it "Administrator", as different users on the communication server you should delete (or rename) the “administrator” account on the IM server and create new user accounts with any other names. Those accounts can have any names like user’s e-mail address or something else. And for each newly created account you should specify a personal authentication with the “Private login/password” mode (if the IM server uses Windows Authentication). 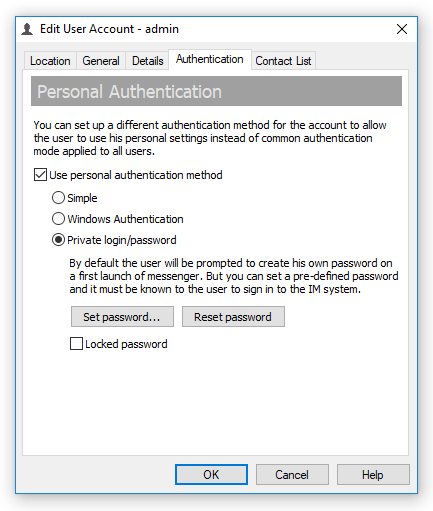 When your users with the “Administrator” Windows logon ID will connect to the communication server then messengers will show the Login tab in their interface to allow the users to enter their private login and password to enter to the IM network. By the way if you only disable the “administrator” user account on Bopup Communication Server then your users with such Windows logon name will not be able to proceed because the messenger will display an error message that the account is disabled on the server and the login interface will not be shown. We deal with the development of software systems in the sphere of instant messaging and real-time communication. The aim of our company is to present efficient and innovative software solutions for the organization in terms of safe exchange of messages, data and documents transmitting between the users in local networks of small offices, companies of small and medium business as well as in large corporate networks. We've decided to get our new users and existing customers informed on changes and additions in the Bopup software. Sometimes a lot of minor and major improvements are not listed in change logs but they are still important. We also want to get feedback and suggestions from users on new features and implementations that could be released in future versions of Bopup Communication Server, Bopup Messenger and Bopup Observer software, and those ideas will be also posted here. Stay connected!